For every Toronto wedding photographer, the bride and groom portrait session can be nerve-racking. Plagued with time delays and adverse weather, a photographer has to be thinking on his feet and there is little room for creativity. That is the reason why I always planned my photo shoots, as I did at this Atlantis Toronto wedding. During my consultation sessions with the bride and groom, I presented the possibility of taking some night shots on the rooftop. I highly recommend taking at least five minutes to visit this gorgeous wedding photography location with breathtaking views of the downtown skyline and the IMAX dome at Ontario Centre. For this particular image, I left the wedding reception with my second shooter and set up the lights so that when the bride and groom arrived, we were able to snap a few portraits in a matter of minutes. In this picture, the bride and groom are positioned along the right guideline in the rule of thirds grid, leaving plenty of negative space on the left side of the frame. 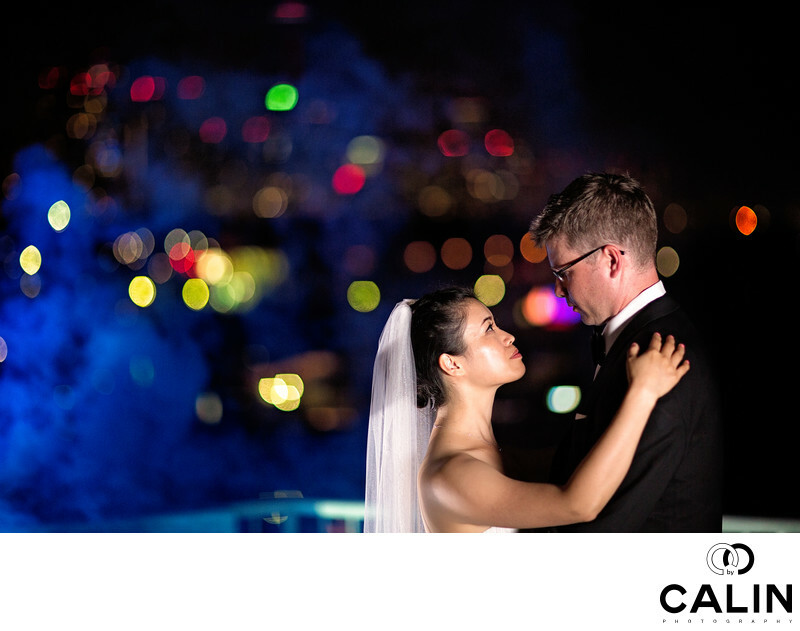 The city lights, rendered out of focus, create the perfect backdrop for this wedding picture. The city lights, by pure chance, create a leading line towards the bride and groom and also balance the image from a visual weight perspective. Even more, for the shot, I used a smoke grenade which adds another element of interest to this gorgeous image. The dominant colour scheme of this wedding photo consists of a range of blue colours peppered by yellow, red and greens. That combination unites two of the most popular colour schemes, the blue and yellow/orange, and the green and red schemes. As usually, there is always room for improvement in wedding photography. In this wedding day portrait for example, I wish I did something to inject emotion in this picture. While everything is perfect visually, the bride and groom are not exuding that happiness which usually accompanies a wedding day. Because I focused mostly on the technical aspects of this complicated picture, I missed the fact that the couple were tired and their mind was in a different place. In terms of lighting, this is a night shots where I balanced the ambient light provided by the buildings in the background, and the two flashes I used to illuminate the couple. The main light, was placed camera right and was given by a flash shot with a translucent umbrella. The hair light was positioned behind the bride and illuminated her veil. To create this environmental portrait I used a Canon 85 mm 1.2 lens shot that F1.2 so that I could capture the most ambient light possible. Among the challenges I had when creating this photograph was focusing in the dark. Sadly, despite the fact the Canon 85 mm 1.2 lens is the best portrait lens, it focuses very slowly, especially in the dark environments. As such, I took about 20 frames to create this beautiful image. That could also be the explanation of the expressionless the bride and groom. In terms of post-processing, my job was simple: I dodged and burned to the image, colour corrected it, and did performed skin retouching.